"Real Fun Real Colorado "
Location of Cripple Creek in Teller County, Colorado. Cripple Creek is the Statutory City that is the county seat of Teller County, Colorado, United States. The city population was 1,189 at the 2010 United States Census. Cripple Creek is a former gold mining camp located 44 miles (71 km) southwest of Colorado Springs near the base of Pikes Peak. The Cripple Creek Historic District, which received National Historic Landmark status in 1961, includes part or all of the city and the surrounding area. The city is now a part of the Colorado Springs, CO Metropolitan Statistical Area. For many years Cripple Creek's high valley, at an elevation of 9,494 feet (2,894 m), was considered no more important than a cattle pasture. Many prospectors avoided the area after the Mount Pisgah hoax, a mini gold rush caused by salting (adding gold to worthless rock). On the 20th of October, 1890, Robert Miller "Bob" Womack discovered a rich ore and the last great Colorado gold rush began. Thousands of prospectors flocked to the region, and before long Winfield Scott Stratton located the famous Independence lode, one of the largest gold strikes in history. In three years, the population increased from five hundred to ten thousand by 1893. Although $500 million worth of gold ore was dug from Cripple Creek, Womack died penniless on 10 August 1909. In 1896 Cripple Creek suffered two disastrous fires. The first occurred on April 25 destroying half of the city including much of the business district. Four days later another fire destroyed much of the remaining half. The city was rebuilt in a period of a few months, most historic buildings today date back to 1896. By 1900, Cripple Creek and its sister city, Victor, were substantial mining communities. During the 1890s, many of the miners in the Cripple Creek area joined a miners' union, the Western Federation of Miners (WFM). A significant strike took place in 1894, marking one of the few times in history that a sitting governor called out the national guard to protect miners from anti-union violence by forces under the control of the mine owners. By 1903, the allegiance of the state government had shifted and Governor James Peabody sent the Colorado National Guard into Cripple Creek with the goal of destroying union power in the gold camps. The WFM strike of 1903 and the governor's response precipitated the Colorado Labor Wars, a struggle that took many lives. The 1904 silent film short, Tracked by Bloodhounds; or, A Lynching at Cripple Creek, directed by Harry Buckwalter was filmed in the area. Through 2005, the Cripple Creek district produced about 23.5 million troy ounces (979 1/6 troy tons; 731 metric tons) of gold. The underground mines are mostly idle, except for a few small operations. There are significant underground deposits remaining which may become feasible to mine in the future. Large scale open pit mining and cyanide heap leach extraction of near-surface ore material, left behind by the old time miners as low grade, has taken place since 1994 east of Cripple Creek, near its sister city of Victor, Colorado. The current mining operation is conducted by Cripple Creek and Victor Gold Mining Company (CC&V) ran currently by Newmont Mining. The mine operates 24 hours a day, 365 days a year. Mine operations, maintenance, and processing departments work a rotating day/night schedule in 12-hour shifts. With many empty storefronts and picturesque homes, Cripple Creek once drew interest as a ghost town. At one point the population dropped to a few hundred, although Cripple Creek was never entirely deserted. In the 1970s and 1980s travelers on photo safari might find themselves in a beautiful decaying historic town. A few restaurants and bars catered to tourists who could pass weathered empty homes with lace curtains hanging in broken windows. Colorado voters allowed Cripple Creek to establish legalized gambling in 1991. Cripple Creek is currently more of a gambling and tourist town than a ghost town. Casinos now occupy many historic buildings. Casino gambling has been successful in bringing revenue and vitality back into the area. It also provides funding for the State Historical Fund, administered by the Colorado Office of Archaeology and Historic Preservation. In 2012, Colorado casinos produced over $104 million in tax revenue for these programs. The gold-bearing area of the Cripple Creek district was the core of an ancient volcano within the central Colorado volcanic field, last active over 30 million years ago during the Oligocene. Free or native gold was found near the surface but at depth unoxidized gold tellurides and sulfides were found. 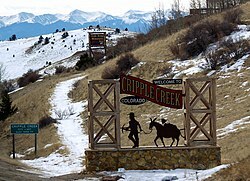 The community takes its name from nearby Cripple Creek. As of the census of 2000, there were 1,115 people, 494 households, and 282 families residing in the city. The population density was 988.7 people per square mile (381.0/km²). There were 737 housing units at an average density of 653.5 per square mile (251.8/km²). The racial makeup of the city was 92.29% White, 0.90% African American, 2.15% Native American, 0.81% Asian, 1.43% from other races, and 2.42% from two or more races. 6.01% of the population were Hispanic or Latino of any race. There were 494 households out of which 23.3% had children under the age of 18 living with them, 44.7% were married couples living together, 7.9% had a female householder with no husband present, and 42.9% were non-families. 30.4% of all households were made up of individuals and 4.9% had someone living alone who was 65 years of age or older. The average household size was 2.26 and the average family size was 2.82. In the city, the population was spread out with 22.2% under the age of 18, 10.4% from 18 to 24, 29.2% from 25 to 44, 30.2% from 45 to 64, and 8.0% who were 65 years of age or older. The median age was 39 years. For every 100 females, there were 104.2 males. For every 100 females age 18 and over, there were 100.0 males. The median income for a household in the city was $39,261, and the median income for a family was $41,685. Males had a median income of $27,600 versus $25,000 for females. The per capita income for the city was $19,607. About 4.7% of families and 6.4% of the population were below the poverty line, including 3.8% of those under age 18 and 6.1% of those age 65 or over. Students are served by the Cripple Creek-Victor High School. There are only four (4) disabled parking spaces within the City of Cripple Creek and very little disabled accommodation in the area. Downtown Cripple Creek in January 2009. The Cripple Creek and Victor Narrow Gauge Railroad, a narrow gauge train ride from Cripple Creek passes several small ghost towns, goldmines, and glory holes. The Mollie Kathleen Gold Mine provides tours into a real gold mine led by a real gold miner. In 2006 Cripple Creek broke ground on the new Pikes Peak Heritage Center. Constructed at a cost over $2.5 million, the building is over 11,000 square feet (1,000 m2) of educational displays. State of the art electronics are used throughout the building and there is also a theatre showing historical films about the area. Newly named the Cripple Creek Heritage Center, admission is free. Cripple Creek is also home to the Butte Opera House, a theatre first managed by the Mackin family (previous owners of the Imperial Hotel and producers of a long-running, much-loved melodrama theatre company). The Butte is currently the home of the Mountain Rep Theatre Company that produces plays, musicals, and classic melodramas year-round, including such shows as Forever Plaid, Hot Night in the Old Town, A Cripple Creek Christmas Carol, The Rocky Horror Show, and The Christmas Donkey. Cripple Creek features many events throughout the year like the Cripple Creek Ice Festival, Donkey Derby Days, the July 4 Celebration, and a Gold Camp Christmas. Cripple Creek is served by the Cripple Creek-Victor School District RE-1. The district has one elementary school and one junior/senior high school, including Cresson Elementary School and Cripple Creek-Victor Junior/Senior High School. Principal of the Jr/Sr High School is Tory Richey and Les Lindauer is the Superintendent of Schools. Pearl de Vere, known as the "soiled dove of Cripple Creek"
^ "2014 U.S. Gazetteer Files: Places". United States Census Bureau. July 1, 2014. Retrieved January 5, 2015. ^ "Mayor and City Council". City of Cripple Creek. Retrieved December 24, 2008. ^ "2016 U.S. Gazetteer Files". United States Census Bureau. Retrieved July 25, 2017. ^ Dan Plazak A Hole in the Ground with a liar at the Top (2006) ISBN 978-0-87480-840-7 (contains a chapter on the Mt. Pisgah hoax). ^ Robert "Bob" Womack of Colorado by Joyce and Linda Womack. Retrieved March 11, 2010. ^ "Archived copy". Archived from the original on May 23, 2014. Retrieved May 23, 2014. CS1 maint: Archived copy as title (link). Retrieved May 22, 2014. ^ "Tracked by Bloodhounds; or, A Lynching at Cripple Creek (1904)". The American Film Institute. Retrieved June 8, 2018. ^ State Historical Fund, Office of Archaeology and Historic Preservation, Colorado Historical Society, USA. ^ Dawson, John Frank. Place names in Colorado: why 700 communities were so named, 150 of Spanish or Indian origin. Denver, CO: The J. Frank Dawson Publishing Co. p. 16. ^ Feitz, L., (1968), Cripple Creek Railroads: The Rail Systems of the Gold Camp, Little London Press, Colorado Springs, ISBN 0-936564-15-6. ^ "(no title)". www.mountainrep.com. Retrieved April 11, 2018. ^ "Cripple Creek-Victor School District". Cripple Creek-Victor School District. Archived from the original on January 22, 2016. Retrieved January 1, 2016. Wikimedia Commons has media related to Cripple Creek, Colorado. Wikisource has the text of the 1911 Encyclopædia Britannica article Cripple Creek. Telluride is the county seat and most populous town of San Miguel County in the southwestern portion of the U.S. state of Colorado. The town is a former silver mining camp on the San Miguel River in the western San Juan Mountains. The first gold mining claim was made in the mountains above Telluride in 1875 and early settlement of what is now Telluride followed. The town itself was founded in 1878 as "Columbia", but due to confusion with a California town of the same name, was renamed Telluride in 1887, for the gold telluride minerals found in other parts of Colorado. These telluride minerals were never found near Telluride, but the area's mines for some years provided zinc, lead, copper, silver, and other gold ores. The City of Central, commonly known as Central City, is the Home Rule Municipality in Gilpin and Clear Creek counties that is the county seat and the most populous municipality of Gilpin County, Colorado, United States. The city population was 663 at the 2010 United States Census. The city is a historic mining settlement founded in 1859 during the Pike's Peak Gold Rush and came to be known as the "Richest Square Mile on Earth". Central City and the adjacent city of Black Hawk form the federally designated Central City/Black Hawk Historic District. The city is now a part of the Denver-Aurora-Lakewood, CO Metropolitan Statistical Area. The City of Idaho Springs is a Statutory City in the western United States, the most populous municipality in Clear Creek County, Colorado. As of the 2010 census it had a population of 1,717. Idaho Springs is located in Clear Creek Canyon, in the mountains upstream from Golden, some 30 miles (50 km) west of Denver. Local legend is that the name of the city derived from annual visits to the radium hot springs made by a Native American chief and his tribe who journeyed there each year from Idaho to bathe in the magic healing waters. Teller County is one of the 64 counties in the U.S. state of Colorado. As of the 2010 census, the population was 23,350. The county seat is Cripple Creek, and the most populous city is Woodland Park. Jackson is the county seat of Amador County, California. The population was 4,651 at the 2010 census, up from 3,989 at the 2000 census. The city is accessible by both State Route 49 and State Route 88. Sutter Creek is a city in Amador County, California, United States. The population was 2,501 at the 2010 census, up from 2,303 at the 2000 census. It is accessible via State Route 49. Gold Hill is a census-designated place (CDP) in Boulder County, Colorado, United States. The population was 230 at the 2010 census. This settlement is located to the northwest of Boulder, perched on a mountainside above Left Hand Canyon at an elevation of 8,300 feet. Originally a mining camp, it was the site of the first major discovery of gold during the 1859 Colorado Gold Rush and remained an important mining camp throughout the late 19th century, with a population approaching 1500 at its height, before falling into decline. It has been revived somewhat in recent years as a quiet isolated haven, with no paved streets, but easily accessed by dirt roads. The town contains numerous historic wooden structures, some restored in recent years, as well decaying ruins from its mining heyday. It has a small museum and two-room schoolhouse, the Gold Hill School, which since 1873 has been the oldest continuously operating public school in Colorado. Other businesses include a General Store and a restored inn listed on the National Register of Historic Places. The town is laid out on a small grid of dirt streets. Georgetown is a Territorial Charter Municipality that is the county seat of Clear Creek County, Colorado, United States. The former silver mining camp along Clear Creek in the Front Range of the Rocky Mountains was established in 1859 during the Pike's Peak Gold Rush. The federally designated Georgetown-Silver Plume Historic District comprises Georgetown, the neighboring town of Silver Plume, and the Georgetown Loop Historic Mining & Railroad Park between the two towns. The town population was 1,034 at the 2010 census. The Georgetown Post Office has the ZIP code 80444. Silver Plume is a Statutory Town located in Clear Creek County, Colorado, United States. Silver Plume is a former silver mining camp along Clear Creek in the Front Range of the Rocky Mountains. The federally designated Georgetown-Silver Plume Historic District comprises Silver Plume, the neighboring town of Georgetown, and the Georgetown Loop Historic Mining & Railroad Park between the two towns. The City of Black Hawk is a Home Rule Municipality in Gilpin County, Colorado, United States. The city population was 118 at the 2010 United States Census, making Black Hawk the least populous city in Colorado. The tiny city is an historic mining settlement founded in 1859 during the Pike's Peak Gold Rush. Black Hawk is a part of the Denver-Aurora-Lakewood, CO Metropolitan Statistical Area. The town of Silverton is a Statutory Town that is the county seat of, and the only incorporated municipality in San Juan County, Colorado, United States. Silverton is a former silver mining camp, most or all of which is now included in a federally designated National Historic Landmark District, the Silverton Historic District. The town population reached its peak of 531 in the U.S. Census 2000. It has grown since then. Victor is a statutory city in Teller County, Colorado, United States. Gold was discovered in Victor in the late 19th century, an omen of the future of the town. With Cripple Creek, the mining district became the second largest gold mining district in the country and realized approximately $10 billion of mined gold in 2010 dollars. It reached its peak around the turn of the century when there were about 18,000 residents in the town. Depleted ore in mines, labor strife and the exodus of miners during World War I caused a steep decline in the city's economy, from which it has never recovered. The population was 397 at the 2010 census. There is a resumed mining effort on Battle Mountain. The Colorado Springs and Cripple Creek District Railway was a 4 ft 8 1⁄2 in standard gauge railroad operating in the U.S. state of Colorado around the turn of the 20th century. The Midland Terminal Railway was a short line terminal railroad running from the Colorado Midland Railway near Divide to Cripple Creek, Colorado. The railroad made its last run in February 1949. Gold mining in Colorado, a state of the United States, has been an industry since 1858. It also played a key role in the establishment of the state of Colorado. The Mollie Kathleen Gold Mine is a historic vertical shaft mine near Cripple Creek, Colorado. The mine shaft descends 1,000 feet (300 m) into the mountain, a depth roughly equal to the height of the Empire State Building in New York City. The mine currently gives tours, and is visited by around 40,000 people annually. The addition of the mines and subsequent tours of this mine and others in the area had considerable effect on the economies of both Victor, Colorado and Cripple Creek. The Victor Hotel is a historic hotel in the mining town of Victor, Colorado in the United States. The hotel is a four-story Victorian brick building built in 1899-1900 by the town's founders, the Woods brothers. It is on the National Register of Historic Places. The Cripple Creek & Victor Gold Mine, formerly and historically the Cresson Mine, is an active gold mine located near the town of Victor, in the Cripple Creek mining district in the US state of Colorado. It is the largest current producer of gold in Colorado, and produced 211,000 troy ounces of gold in 2014. It was fully owned and operated by AngloGold Ashanti through its subsidiary, the Cripple Creek & Victor Gold Mining Company (CC&V). In June 2015, AngloGold agreed to sell the mine to Newmont Mining Corporation. The purchase by Newmont was completed in August 2015.